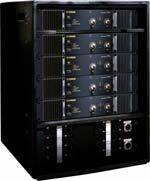 Yamaha's 2 ohm, UL-approved Tn Series amplifiers provide plenty of power to drive line array speakers such as the NEXO GEO Series, as well as the PS Series and the Yamaha Installation Series. Three models are available and range from the Tn5, which delivers 2300W (stereo at 4 ohms), 5000W at 4 ohms bridged; the Tn4 delivers 2000W (stereo at 4 ohms), 4400W in 4 ohms bridged mode; and the Tn3, which delivers 1400W (stereo at 4 ohms), 3800W at 4 ohms bridged. The input gain level for all models is 26dB. Unique to the Tn series, the amplifiers feature a high-power cooling fan that automatically stops when an input signal ceases. Solid State Logic has announced two new modules for the X-Rack system: the Four Channel Input, a four mono line input module; and the Master Bus, a summing, metering, and control room module. Together the new input and output modules allow users to build a multi-input, dual stereo bus mini SSL with Total Recall. The new Four Channel Input module takes four line-level mono signals, each with their own solo, volume and pan controls and provides options to route them into either the X-Rack Master Bus or Record Bus. Each input also has its own insert point to integrate other X-Rack modules (or outboard units), that can be switched into the signal path. beyerdynamic's Revoluto microphone station provides sound reproduction without the use of a gooseneck microphone. Utilizing line array technology, the microphone capsules in the Revoluto create an omnidirectional pattern allowing the speaker to move around without affecting the volume or sound quality. Due to its multi-capsule design, the Revoluto provides additional redundancy with no loss of pick-up. In addition, the Revoluto's low-profile design provides a clear view of the speaker. dhead:Lexicon's MX200 dual reverb/effects processor combines an intuitive front-panel design with a USB connection and VST interface for use with software recording platforms. In any application, the MX200 offers versatility and instantly accessible reverb, dynamics and special effects with the signature Lexicon sound. The MX200 provides a USB interface with an intuitive cross-platform VST plug-in window, allowing the MX200 to function as a hardware plug-in within any VST-compatible workstation environment. FiberPlex's LightViper EF-2 is a dual channel 10/100 ethernet-to-fiber converter. The 1U rack-mounting EF-2 will accept two independent channels of 10/100 Ethernet via two standard RJ-45 connector/receptacles and then convert the signals to two fiber optic transmit/receive pairs. It will operate in a choice of three configurations: standard ethernet using transmit (TX) and receive (RX) pairs (standard mode); two channels of single direction Ethernet (TX-only); or as a combination of both modes. The EF-2's operating modes may be easily changed by a switch located on the rear of the unit. Audio-Technica announced three new vocal mics as part of its next generation of the Artist Series live sound microphones. The three new Artist Series vocal mics include the ATM410 cardioid dynamic microphone, ATM610 hypercardioid dynamic microphone, and ATM710 cardioid condenser microphone. ATM410 Cardioid Dynamic is designed for smooth, natural vocal reproduction and low noise. ATM610 hypercardioid dynamic is tuned for clear, detailed, extended-range reproduction of lead and backup vocals. ATM710 cardioid condenser is tailored for exacting detail and high-fidelity vocal reproduction. Neutrik's PRX Series right angle phone plugs are suited for instrument cables and is available with Neutrik's Silent Plug. With the PRX Series, Neutrik expands its PX series of 1/4-inch phone plugs with a right-angle version, incorporating a robust diecast shell in an extra-slim design with a compact barrel for optimum handling convenience and highest packing density. The PRX's unique rivetless one-piece tip contact helps prevent hook up in a socket or break off at the tip. Other features include improved chuck-type strain relief for reliable cable retention; nickel or gold plating for durability and best conductivity; and both mono and stereo plugs to satisfy cable assemblers. SLS Loudspeakers' LS6593 and LS6593A line array speakers concept is based on a woofer line array mounted on a front panel with a coaxially-positioned ribbon tweeter array. The woofer array consists of 6 x 5.25-inch drivers while the tweeter array consists of 9 x 3-inch proprietary ribbon planar drivers driven from a passive crossover point of 2,000 Hz. The system delivers a frequency response of 80Hz to 20kHz with an SPL of 94 dB referenced at 1W/1M and a calculated response of 118dB continuous and 124 dB peak. The system handles up to 600 Watts of amplifier power. Auralex Acoustics' Screen6 system consists of six pArtScience SpaceCouplers. The Screen6 System can be placed on hard walls and ceilings to tame early reflections common in mix rooms and home studios without taking energy out of the room. With a Screen6 cloud or wall grouping from Auralex, energy from the monitors or the sound you are trying to capture is spread out, thereby removing the discrete reflection while keeping the energy's contribution to the room's reverberant tail. As the angle of the sound source increases, approaching grazing incidence, the SpaceCoupler provides increasingly more diffusion. Turbosound's TA-500DP amplifier module offers typical operating efficiency in excess of 90 percent, contributing to a lighter and more manageable product. The module incorporates sophisticated DSP, including active crossovers, output limiters and impedance monitoring, making up a completely self-contained and optimized audio system that requires only a line level signal feed to give consistent and reliable performance. To coincide with the launch of the TA-500DP, Turbosound has also launched the LMS-BVNet card, which fits into the option slot on the rear of LMS-D24 and LMS-D26 controllers giving full control over all the DSP functions in real-time.